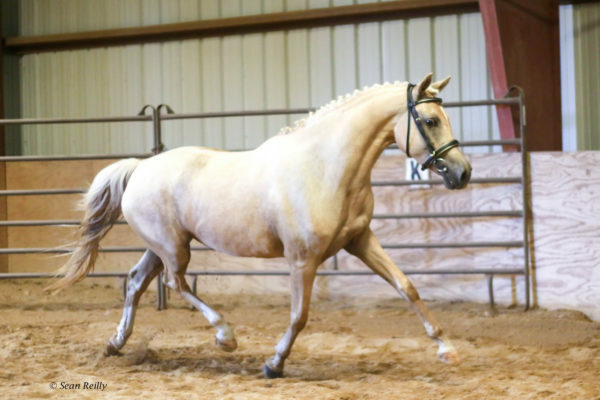 This golden palomino mare of 2015 is a superb example of German Riding Pony breeding. She is by the 2015 Hanoverian pony Champion Cocktailzauber, out of an excellent damline of Gia, who was herself sired by another reknown pony champion, Makuba! 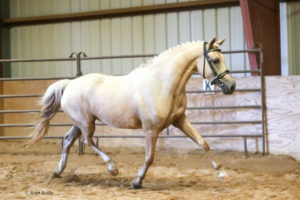 She is an easy going, “charming”, and beautiful mare who gets along with everyone, horses and humans alike! Easy and willing when started under saddle as well. She sports the amazing gaits and presence of her sire, while retaining the stout but elegance of Makuba himself. Truly a dream in pedigree, we are anxiously anticipating her first foal by Evans Providence of the night who should increase pony typeyness AND downsize her to US standards. Cocktailzauber is 2011 Buckskin German Riding Pony Stallion (Top Carlos Cassini x Cocky Man – Night Star I) Champion of the 2013 Hanoverian Pony Licensing, he thrilled everyone at the 2013 Hanoverian pony and small horse licensing as he was licensed and crowned champion of the German Riding Pony division by the breeding committee. The enchanted public celebrated him with a standing ovation as he was presented in the victory lap! Breeding committee member and Hanoverian Pony Breeding Director Volker Hofmeister praised him with the following comments, “We have seen an extremely strong moving champion stallion here with grand conformational harmony. He stood out even amongst a very strong field of young stallions. Cocktailzauber had already been exciting everyone after his outstanding performance at the 2011 German National Foal Championships. Not only was the audience impressed, so were the judges. Three perfect 10’s were given for his movement, three 9.5’s for his type, and two 9.5’s and one 9.0 for development and correctness. Finally, he received the score of 9.5 from all three judges for overall impression and was named champion of the German Riding Pony Foals. Dream scores that only the best could expect!With three elastic and ground covering gaits as well as fantastic jumping talent. Cocktailzauber’s sire, Top Carlos Cassini (Classic Dancer I) was the 2009 champion of the Westphalian German Riding Pony licensing in Munster-Handorf and was honored as the 1f Premium stallion in the 2011 German Riding Federation national stallion show in Berlin.Excellent genetics are also reassured from Cocktailzauber’s damline. His dam, St.Pr.St. Caprice, is the full sister to the successful dressage pony, Catwalk’s Pr!ima Ballerina, and she is half-sister to the licensed stallion, Cappuccino (Costolany) and the successful sport ponies, Nogger (Nobel), Lady Blue Eyes (Nantano) and Pico. 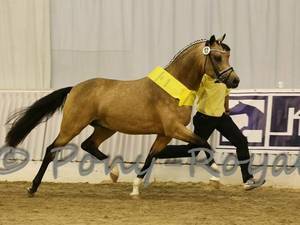 Cocktail’s half-sister, Dilaila (Der Feine Lord), was ranked as the 1c Premium in the 3 yr. old Pony division in the 2011 show in Lienen. Cocktail’s great grandmother, Anja, was also the dam of the licensed stallion Night Dream (Night Star I) who was the German national champion of the young jumper ponies at the Bundeschampionate and participated in the German Masters in dressage. 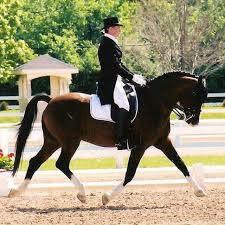 Makuba, definitely a legendary contributor to German Riding Pony breeding in the USA! Owned and imported from Germany by Klaus Biesenthal. Everyone knows his name! He competed successfully for many years in the dressage arena, and even met great succcess in the FEI ring through I-1, also successful in combined driving both as a single and in pair! Makuba has many champion offspring both sons and daughters that continue his strong and greatly cherished performance lines today.